We are SO inspired by local initiatives that think outside the box and create something unique for the global marketplace. HAND/EYE is the world’s only journal dedicated to global creativity. With the help of talented writers and photographers from around the world, it focuses on the work of artists, artisans, designers, and other creatives, unfettered by traditional definitions of art, craft and design. Get a glimpse of some of the ”colossally talented African artisans, designers and artists” they have covered – or just look these over. Inherent Sense of Innovation – where discarded plastic pipe is collected, hand cut and carved by semi-Nomadic tribes in northwestern Namibia, and turned into a collection of unisex bracelets. The look and feel of the material is similar to bone, yet no animals have been harmed in the process. The Base Project partners with artisan entrepreneurs who have gathered their existing resources to create a highly valued product, and in return, they reap numerous rewards, while bettering themselves and their community. Transforming Lives – by turning plain clay into coveted art for the likes of the queens of England, Malaysia & empress of Japan, as well as The White House. An Ardmore pot is even illustrated on a South African postage stamp. ”Thinking Globally, Acting Locally” – is the motto of Streetwires, a social enterprise that encompasses the ingenious spirit of many living in Cape Town. In 2000 Patrick Schofield was impressed by a working wire and tin radio that a friend had purchased. Since then, his idea to fight poverty by selling wire and bead art has provided permanent employment and business training to over 120 artists. Artists use wire, tin, beads and metal as their medium, crafting everything from small key chains to sophisticated, high-end sculptural designs. Weaving Culture – one stitch at a time, for depictions of daily life by Mogalakwena‘s embroiderers. Beading for Business – where 450 women artisans living in the township near Cape Town make products such as beaded animals, dolls and accessories – that got into Monkeybiz collaboration with the likes of the Haas Bros at New York’s Cooper Hewitt. Socially Responsible Weaving – where Mungo’s integrity and ethos bedrock teaching locals to spin and weave. 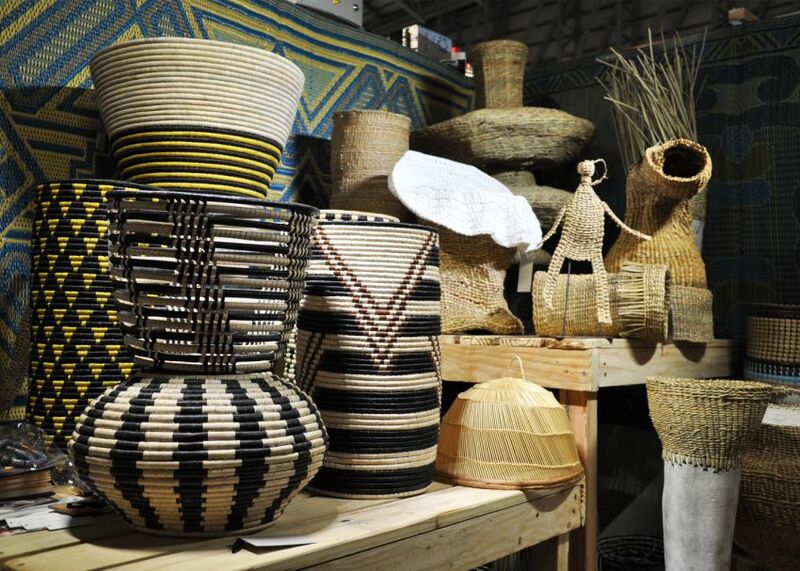 Supporting the Locals – Johannesburg based Kim Sacks brings rural craft from all over South Africa to her gallery to promote indigenous creativity and material culture in a respectful way. What she looks for are objects made by the human hand that reflect the inherent essence of the spirit of the maker, which one can intuit. She makes sure that the producer is being paid fairly. That’s her criteria – it’s about human hands, small workshops, and individual makers from folk art to fine craft. Artists are fine-tuning the custodianship for the next generation. Planting seeds for the next generation to take up the reigns. Amen to that.